Individuals who own real estate properties should have a living trust prepared. This document is essential for legally assigning the persons who will be the heirs to the property and what will happen to the property upon the death of the owner. However, if a property owner wants to have a living trust that he can update or alter over time whenever his mind and decisions change, then he must use a specific form which is known as the revocable living trust form. 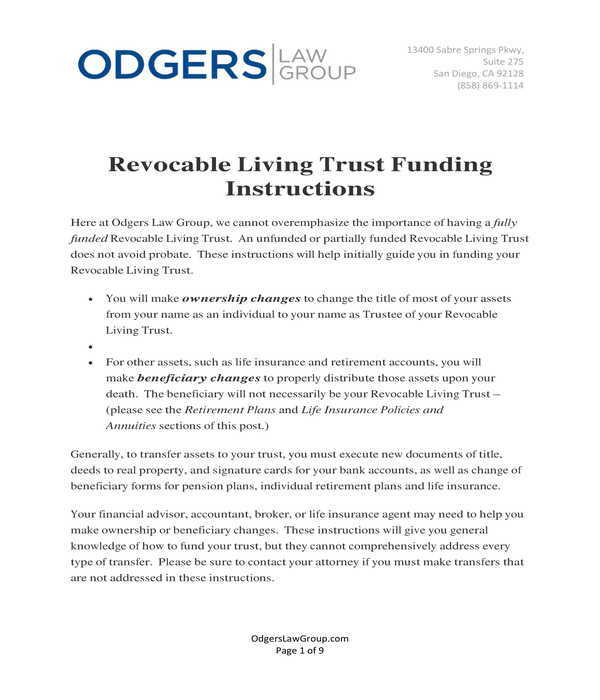 Revocable Living Trust Funding Instructions Form – This form type is suitable to be provided to an individual who wants to have a fully funded revocable living trust. The property or assets owner will be able to know the importance and the benefits of preparing a revocable living trust under the assistance of the law group and attorneys who are experts in the real estate field. In addition, the instructions form will also allow the property owner in obtaining a list of required legal forms or documents that he must supply to the lawyer or attorney to prove which will be used for the preparation of his living trust. And lastly, instructions on how to transfer assets will also be included in the form as well as tips to be noted by the property owner such as reviewing his living trust and in contacting his attorney or lawyer in the event that there are changes in his family, net worth, and taxes. 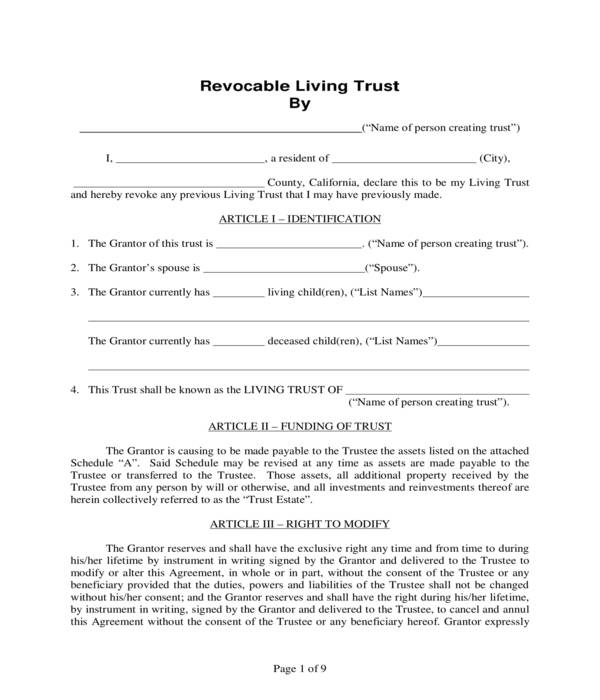 Revocable Living Trusts Agreement Form – This is the form to use if the intent of a property and assets owner is to construct a legal agreement between him as the grantor and another party as his trustee. 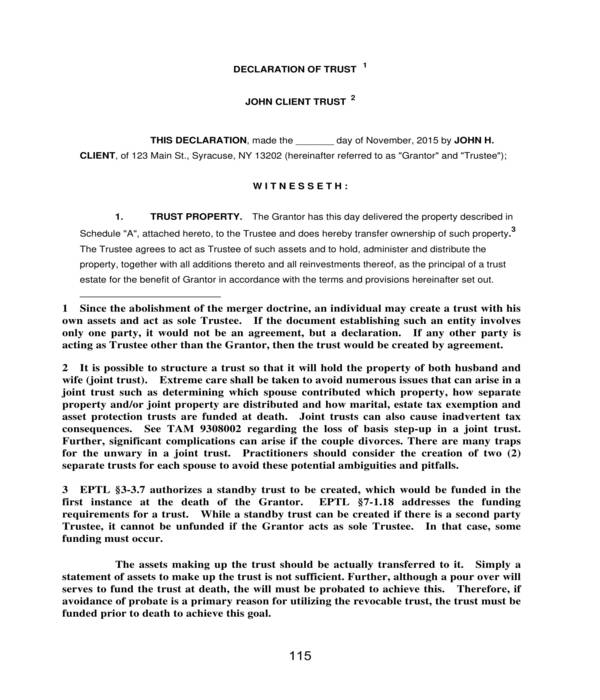 The agreement form will state the names of the parties and their roles in the trust, the name of the trust, the details of the property transfer, as well as other clauses which are necessary for explaining that the properties and assets of the grantor are to be given to the trustee upon the grantor’s death. Moreover, the power of the trustee and his successors, and clauses regarding possible revocations and agreement addendums or amendments will also be included in the revocable living trust agreement form which will then be signed by both parties and their witnesses. Revocable Living Trusts Declaration Form – The purpose of having a revocable living trust form is to document the details of the owned property and the events or activities which should be done if the owner of the property dies. Although most living trusts include another entity or party, there is one type of revocable living trust which identifies the property owner as the sole grantor and the trustee of the trust. 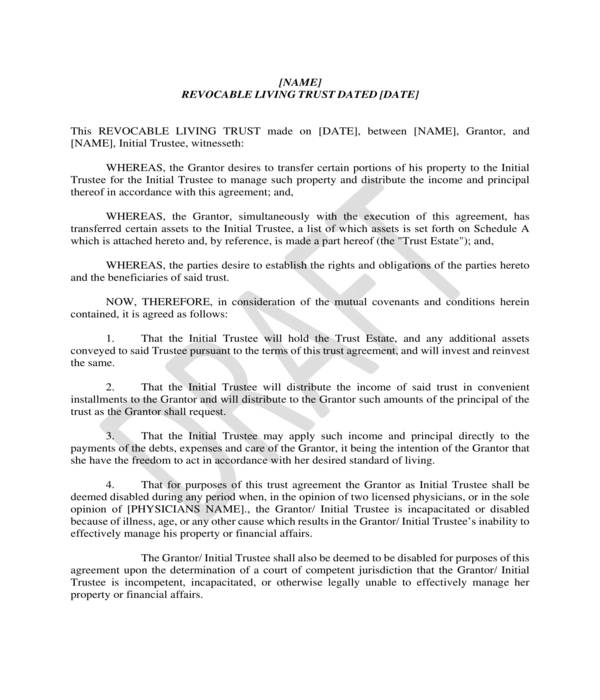 This form is the revocable living trusts declaration form which is specifically for declaring and affirming that the property is owned by the grantor. This type of trust is commonly used by married couples who jointly own the properties that they have purchased during their marriage. 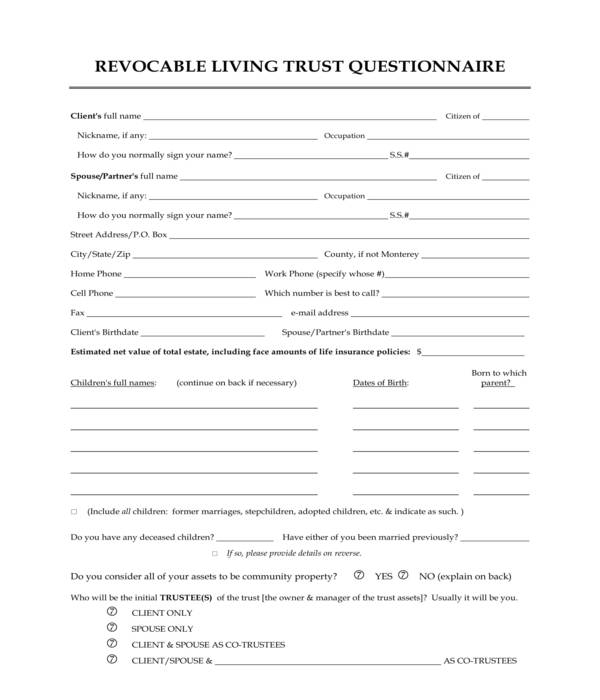 Revocable Living Trusts Questionnaire Form – Property owners must create a living trust or any legal form with the guidance of an attorney. During the client session or the initial interview, the attorney will be asking the property owner about the details of his family, himself, and his properties. These pieces of information can also be documented in a revocable living trust questionnaire form to aid the attorney in knowing what contents should be incorporated into the property owner’s or the client’s living trust. Specifically, the form will collect the information of the client and his spouse or partner, the estimated total value of the client’s owned estates, the identifications of the trustees and heirs, and sets of questions regarding the client’s beneficiaries, assets, taxes, and cash gifts. Consistency is key: Being consistent is important in any type of legal form especially if it deals with authorizing power and transferring properties. Basically, in a revocable living trust form, the attorney of the property owner must ensure that there is consistency in the entirety of the document as well, specifically in the fund sources which will be used for paying the real estate property’s taxes upon the owner’s death. Aside from the consistency, the source should also be specified and must be verified by the attorney to make sure that the payments will be obtained. Create a standby trust for a possible second trustee: The purpose of a standby trust form is simply to have a document which states the alternative option for the grantor of the trust. However, the terms and provisions of a standby trust could not be executed if it is not funded and not permitted by the grantor and the authorized trustee as compared to the trust declaration and agreement forms. Limit powers and abilities: Avoiding the possibilities of abuse of power and authority is the reason why the powers and abilities in a revocable living trust form must be limited by the grantor. This includes the limitations of the trustee’s ability to withdraw and transfer his role to another party who is not included in the trust. And lastly, legal advisers must be hired by the parties involved. Legal advisers help clients meet their needs as well as the requirements of the State when making and transacting agreements and transfers. And aside from an attorney or a lawyer, a grantor should also appoint a trust protector who will be looking after the actions of the trustees to ensure that the property of the grantor will not be used in vain or be abused. 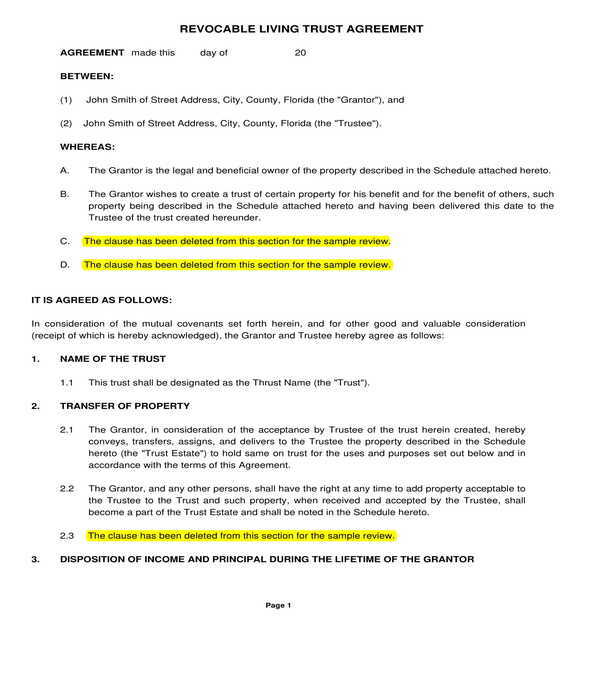 And although the trust protector is the authorized decision-maker, director, and restrainer of the trustee, his power should also be limited and be defined in the living trust form to ensure that there is a common and general understanding of what his limitations and capabilities will be in lieu of the trustee’s benefits and the grantor’s property.